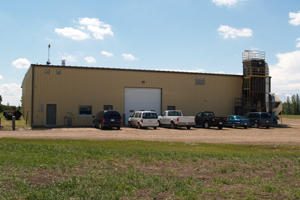 The Breeder Seed Facility is a state of the art 10,000 square foot seed cleaning facility located on the Kernen Crop Research Farm. The facility is used to clean the U of S Crop Development Centre's breeder seed, which is shipped to select seed growers and seed companies across Western Canada. The CDC produces breeder seed of 65 different varieties representing 12 different crop kinds. The faciltiy utilizes a variety of different equipment pieces including a screen machine, gravity table, Dodder Mill and a huetronic color seed sorter.